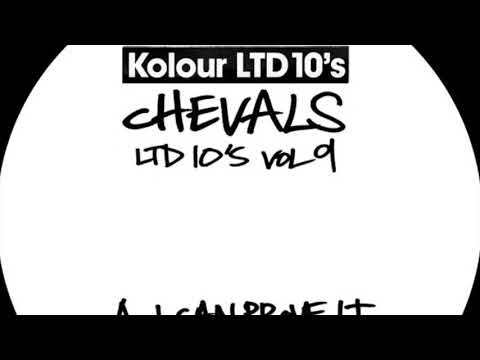 Parisian Disco surgeon Chevals is back in action with a fresh 10” on Kolour LTD. The release marks the producer’s third outing, and curiously, all of the mysterious horseman’s records thus far have been with American imprints. After sell-out drops on Homage and Better Listen, Chevals moves his magic to the longer-tenured KLRLTD for the 9th entry in their 10” series. Our premiere comes via the A-side in “I Can Prove It”. It’s a midtempo, loopy disco gem that sits perfectly in Kolour’s established soundscape. The chopped vocal sample builds in via clever filtering and phrasing before unleashing into epic fullness, accompanied by a chorus of strings and horns and all. Of course, like on all of the Frenchman’s productions, the drums just straight-up bang. Also, the flipside hosts a very very nifty Philly disco edit, but we’ll leave the details of that for another outlet. It seems this horse cannot be held, as Chevals continues to add to his catalogue of tastefully effective reworks. The two-tracker is a nice entry for a mainstay like Kolour, too: serving to both diversify the roster with some new blood and add cohesively to its deep discography. Anyways, be sure to cop this sure-to-be in demand 10” in a couple weeks. Set that Juno reminder!